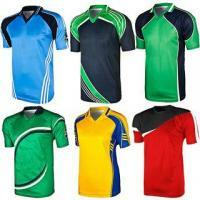 Track Sports Apparels was established in the year 1993. We are leading Manufacturer & Supplier of Sports Shoes, Jumping Vault Foam Beds, Pole Vault Pits, Sports Jerseys, Sports Track Suits, Sports Shorts, etc. The company has diversified into the manufacture of school uniform T shirts,tracksuits,jerseys, shorts,t shirts athletic sets made from Indian as well as imported knitted cloth. Apart from that high jump,pole valt,jumping foam pit, wrestling mat.